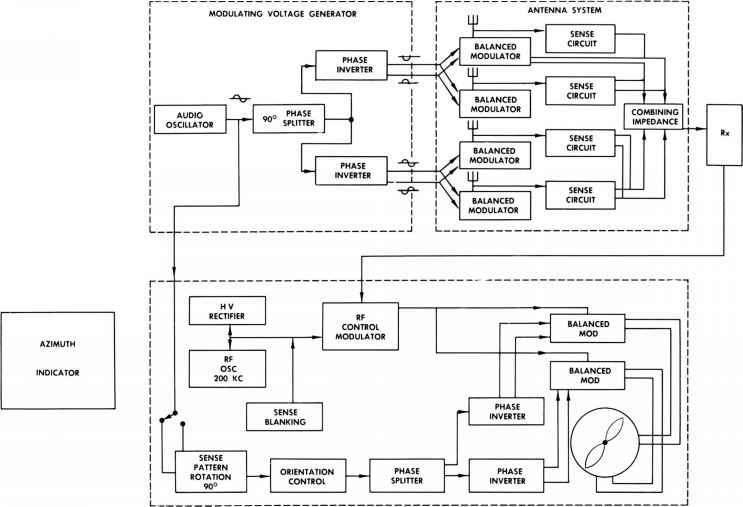 As you can see in the block diagram of a simple direction finder, the three basic units of a direction finder are a directional antenna, a radio receiver, and an indicator. Antennas. Two simple antennas which qualify as directional antennas are the loop antenna and the U-antenna. Such antennas have a directional response pattern which takes the form of a figure 8, as you can see in the illustration above. the two arms are equal, but opposite in phase. They cancel. When a wave arrives in the same plane as the vertical arms, the voltage induced in the closer arm is out of phase with the voltage induced in the farther arm. Only partial cancellation takes place, and the total voltage is maximum. However, as the figure 8 shows, there can be nulls (complete cancellation) in two directions, and maximums (the least amount of cancellation) in two directions. Thus, the response of a single loop or U-antenna, shows the line of movement of a radio wave but does not distinguish between two possible directions of arrival. A null indicates only that a t ransmitter lies in either of two opposite directions. To get a response which will show true direction, the response of a directional antenna must be combined with the response of a nondirec-tional (sense) antenna. A monopole vertical antenna meets the requirements for a non-directional antenna. You can see the combined response pattern in the accompanying illustration on page 150. It is the figure in solid outline. Its shape is cardioid (heart shaped), and it represents the resultant of the directional and nondirectional responses shown in broken outline. 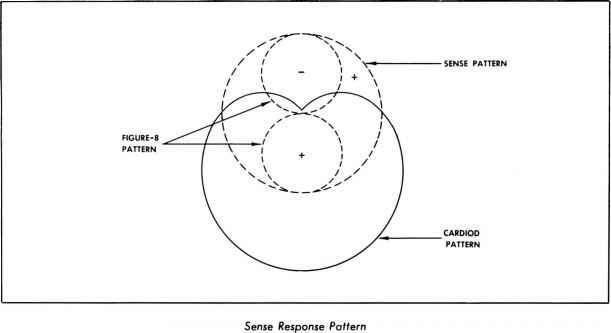 The two lobes of the directional response (the figure 8) are of opposite polarity. However, the nondirectional response has the same polarity in all directions. This means that, in combination, the nondirectional response cancels one lobe of the figure 8 and increases the amplitude of the other. The resulting cardioid pattern has only one null. Thus, the null of the cardioid pattern can indicate only one direction. In direction finding, the null is used instead of the maximum, for it permits more accurate bearings than the maximum. Note that the null of the cardioid pattern is 90° removed in direction from the two nulls of the figure-8 pattern. This 90° difference must be taken into account in calibrating the indicator. Operation to provide a cardioid pattern showing true direction is called sense operation. Operation to provide a figure-8 pattern showing the plane of movement of a radio wave is called bearing operation. Receiver. The receiver used in a direction finder amplifies and detects the varying response of the antenna system and makes it available for the indicator. The direction finder receiver is usually a highly selective superheterodyne. Cathode Ray Tube Patterns indication. For visual indication a pointer is usually used against a scale calibrated in degrees. 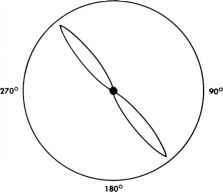 On the scale, north (either magnetic or true) is the reference point,. For aural indication the receiver supplies a heterodyned audio tone signal, with zero beat indicating aural null (minimum or no sound). The most satisfactory visual indicator makes use of a cathode ray tube. The face of the tube is calibrated in degrees with reference to north. Notice the two examples of cathode ray indicator patterns on page 151. The indicator pattern at A is propeller shaped, with the propeller tips indicating bearing. Since the tips point in opposite directions, the pattern does not indicate true bearing. For true bearing the pattern at B is used. This pattern is the cathode ray equivalent of the cardioid pattern used to show true bearing. 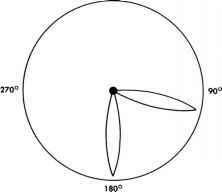 What works on principle of direction finder?